Despite their abundance at one time in India and other Asian nations, wild mahseer populations have been declining because of degradation of aquatic ecosystems, urbanisation and indiscriminate fishing. Mahseer are presently struggling for their mere existence in different lakes and rivers of the Indian sub-continent. Depletion of broodstock has severely affected the availability of healthy seed for its sustainable management. Therefore, captive rearing, breeding and propagation of mahseer are necessary challenges for the fishery scientists and other stakeholders to address. 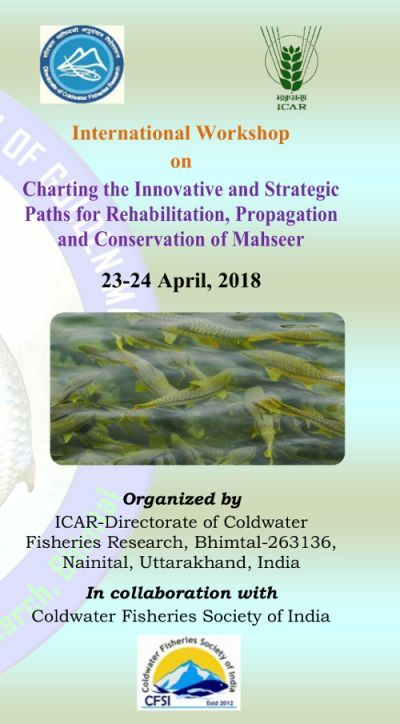 In view of the aforesaid facts, an international workshop on Charting the Innovative and Strategic Paths for Rehabilitation, Propagation and Conservation of Mahseer will be convened with an aim to discuss researchable issues and to build a strategic action plan for sustainable management of mahseer in fisheries and aquaculture. Eminent scientists from India, England, Thailand, Malaysia, Sri Lanka, Bangladesh, Nepal and Bhutan will deliver lead talks on key issues during the workshop. For more information including contact details, please download the brochure below.